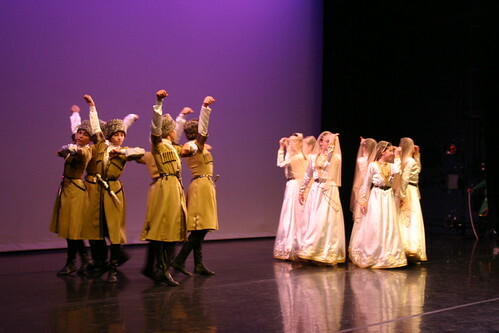 Daimohk’, meaning ‘ancestral land’ in Chechen, is a dance group comprising 28 dancers (aged 8 to 16) and five musicians from Grozny, who together perform the traditional acrobatic dances and musical mantras of their homeland. Daimohk was founded in 1998 by Ramzan Akhmadov – former star of the Chechen National Ballet and Celebrated Artist of the Russian Federation – and his wife Aiza, a dancer and choreographer. Ramzan saw dance as a way to give a generation of children surrounded by violence and aggression a positive creative focus and emotional self-expression. Only 6 months later, Daimohk’s breathtaking and varied programme – from energising acrobatics and sword-throwing, to graceful formations and mesmerizing instrumental numbers – won the Chechen Republic’s Competition for Artistic Excellence. In early 1999, Ramzan converted a disused building into a dance hall. Relatives and friends helped clear the rubble and put exercise bars and mirrors on the walls. With the launch of the second offensive later that same year, the children and their families were dispersed throughout the North Caucasus. Looking to reunite the company Ramzan approached UNICEF for assistance, and was put in touch with Chris Hunter of CPCD, one of few NGOs operating in the region at that time. The children of Daimohk and the inspiring people working with them form a unique cultural project, which since 1999 has inspired audiences in Chechnya, all over Russia and in twelve European countries with their excellent displays of traditional Chechen culture. They regularly take part in Russian dance and cultural competitions and in recent years have travelled to Sochi, Moscow and Rostov-on-Don to participate in such events. In Sochi they won first prize. Their participation in such well publicized events plays an important role in the vital reconciliation process between Chechens and Russians, whose relations have been severely damaged following 13 years of warfare and conflict. The children of Daimohk show a very human face to the Chechens, which helps to deconstruct the stereotype of fighters that remains in the minds of many Russians. Similarly, the friendship between Chechen and Russian children and accompanying adults at such events helps to bring out the humanity and warmth on both sides. It is vital for everyone in Russia that such reconciliation occurs if the country is to overcome the hatred and fear that remains following the Chechen wars. The Daimohk ensemble has almost completely renewed itself over the last couple of years, and the new intake of young dancers is busy training and learning. Daimohk has been in great demand recently, performing at various events. They also took part in an all-Russia talent competition ‘Delfiskie Igri’ in the city of Novosibirsk, Siberia in May 2008, where they won first prize. 3000 children from 74 regions of the Russian Federation took part, including 31 ensembles. Daimohk received the highest number of gold medals – 31 in total! Russian speakers, please see this report. This was a remarkable achievement considering the group has had so many new children join it in the preceding 12 to 18 months. Many of the older boys and girls have left Daimohk to join the adult Chechen ensembles, which are keen to recruit Daimohk youngsters.